Baltimore. At the meeting, I was fascinated to hear one of the attendees, affectionately known as Ms. Betty, speak of the 50th Anniversary of the Mississippi Freedom Summer and her experiences -- a 50 years apart – working towards the same cause: the right to vote. She was understandably disappointed and upset by the lack of progress after five decades. One critical reason for the lack of progress in establishing the right to vote for all citizens, especially African Americans, is the disenfranchisement of incarcerated and even formerly incarcerated people. Although more than a century ago, the Supreme Court held the right to vote as “fundamental” in Yick Wo v. Hopkins, about 5.85 million U.S. residents are disenfranchised today because of felony convictions. The Sentencing Project reports that 2.5 percent of the voting population – 1 in 40 adults – is disenfranchised. However, the rate of disenfranchisement is almost four times higher for African Americans than non-African Americans. This means that 1 in 13 African Americans of voting age is disenfranchised. Furthermore, in Florida, Kentucky and Virginia, more than 1 in every 5 African Americans is unable to vote. This denial of the most basic and central right of citizenship is pervasive at every level of the criminal justice system. Even if one believes that people currently incarcerated in prison should not be able to vote, the problem lies in the fact that this right is often denied for those held pretrial in jails and after they have been released from incarceration. 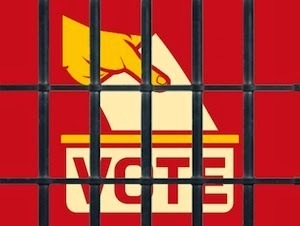 Despite the fact that people held pretrial in jails are eligible to register and vote, the American Civil Liberties Union states that there is “a misconception on the part of some jail officials and local election authorities that people detained in jail cannot vote, and there are few programs that make it possible for detainees to exercise their right to do so.” This is especially problematic because nationally, the jail population is disproportionately composed of people of color and individuals who are too poor to afford bail. JPI’s recent 2013 report Virginia’s Justice System: Expensive, Ineffective and Unfair concluded that Virginia’s rate of felony disenfranchisement was substantially higher than the national average, affecting the African-American population even more severely. Although Gov. Bob McDonnell enabled the automatic restoration of voting rights upon completion of judicial obligations and granted voting rights to 5,235 people with felony convictions, JPI reveals that this clemency only applies for offenses labeled as “non-violent” or “not serious” by the state, requiring more work going forward. However, JPI believes that the “positive recognition by lawmakers that post-conviction collateral consequences are an important issue” is very promising. Gov. Terry McAuliffe continued Gov. McDonnell’s work and pursued a policy to reduce the time people with convictions for violent felonies must wait for a reinstatement of their voting rights. Since beginning his term, Gov. McAuliffe has restored voting rights, and other critical civil rights, to more than 800 people. In 1964, the Supreme Court stated in Reynolds v. Sims, “Any alleged infringement of the right of citizens to vote must be carefully and meticulously scrutinized … ” Despite action to protect voters in the 21st century and the acknowledgment of the importance of voting as an exercise of one’s voice as a citizen, recent legislation such as the Voting Rights Amendment Act does not address the disenfranchisement of formerly incarcerated people. The Voting Rights Amendment Act speaks to discrimination against people of color and is narrowly focused on updating the Voting Rights Act as per Supreme Court Chief Justice Robert’s instructions in the Shelby County v. Holder decision. The bill is a great step forward and seeks to provide critical protections for voters; however, the disenfranchisement of formerly incarcerated people and those held pretrial in jail is an issue relegated to the backburner.